Ballad of the Burning Star, the latest show from chameleonic theatre company Theatre Ad Infinitum, opens with a bomb warning. It’s an explosive statement of intent from a group of theatremakers who were last seen wordlessly exploring love and loss in gentle mime showTranslunar Paradise. Ballad, a blistering satirical cabaret that provocatively examines the Israeli-Palestinian conflict, is about as far away as Theatre Ad Infinitum could get from the moving tale of a grieving widower which propelled them to worldwide success. As co-artistic director Nir Paldi says of the company, “it would be very hard to say ‘ah, they do this’”. Ballad is very much Paldi’s project; as he explains, he and fellow artistic director George Mann take it in turns to lead the company’s shows. The group of Lecoq graduates “want to constantly be doing different things and different styles”, boasting a back catalogue that ranges from reinventions of classical myths to creative explorations of depression and love. Ballad, however, is by far and away their most ambitious production to date. It emerged as a result of Paldi’s need to find a way of talking about his experiences of growing up in Israel and took a number of years to find its current form. The difficulty, as Paldi quickly discovered, was in finding a theatrical metaphor that could contain the many sensitive complexities of the political situation in Israel. “I really felt that I needed some mechanism to distance it from myself and to make it clear to the audience that as a theatremaker I’m conscious of the complexity in quite a declarative way,” Paldi explains carefully. The show began life as a straightforward autobiographical monologue, but both Paldi and Mann sensed that the material needed a different vehicle. This arrived in the form of drag, an instinctive artistic choice that Paldi says he simply thought “would be really fun”, but which developed into a multi-layered theatrical device. 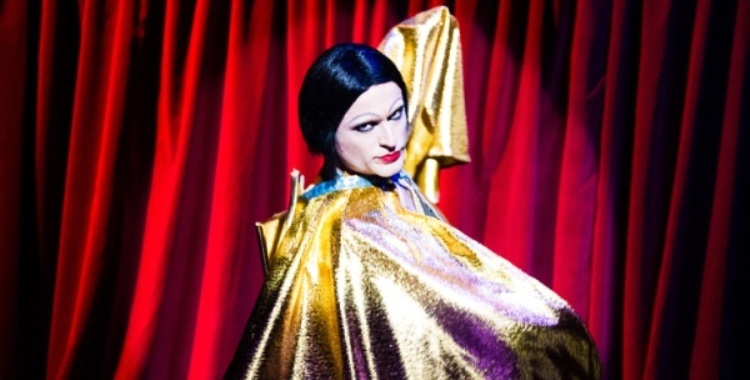 Paldi thus occupies the centre of the show as the larger-than-life Star, a fabulous but bullying cabaret host, supported by a troupe of dancing “Starlets”. Discoveries of this kind often emerge from the stylistic decisions imposed on Theatre Ad Infinitum’s creative process. The first thing the company looks for when starting to research a show is a form that will work for the subject matter in question – mime for Translunar Paradise, cabaret for Ballad. This then establishes the limits of the piece, allowing the work of making the performance to take place within those limits. “It’s a constraint, but actually it’s a creative constraint, so that’s the thing that allows you to start working,” says Paldi, echoing the words of co-artistic director Mann. In resolving this question, the role of work in progress showings and audience feedback in Theatre Ad Infinitum’s process became more vital than ever. Paldi is enthusiastic about the virtues of testing work on audiences during its development, explaining that “it just gives you such a strong image of where you are”. It was these early audiences who pushed Paldi and his creative team to go further with the piece, encouraging them to make the show increasingly provocative. With this in mind, Paldi meticulously researched the viewpoints and arguments from both extremes, daring to make Ballad potentially inflammatory but determined to avoid becoming one-sided. As Theatre Ad Infinitum also begin work on their new show – the company are nothing if not multi-taskers – they are still keen to “reinvent ourselves every time”. Light, which will premiere at this year’s Edinburgh Fringe, is different again from Translunar Paradise andBallad of the Burning Star. This new piece, which Paldi describes as “George’s baby”, is inspired by Edward Snowden’s recent revelations about the NSA and by a dream of Mann’s about a “totalitarian, futuristic society”. Drawing on sci-fi influenced aesthetics, it will examine “what happens when technology is being misused by human beings and it falls into the wrong hands” – all without words.